These exclusive necklaces are only available here and can be used by men and women. 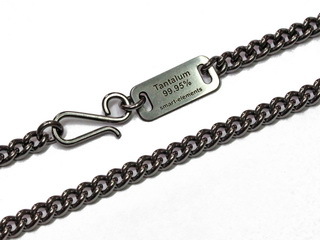 Unlike silver jewellry Tantalum does not stain your skin even when wearing continuously. Perfect for allergic persons! Two different sizes will be available. Each necklace is shipped in a noble jewelry gift-box. Each necklace comes with an elaborated laser cut and highly polished tag engraved with the name and purity of the used material. The back side of the tag bears the registered unique serial number.